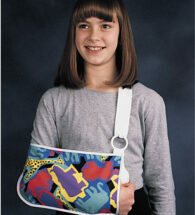 The Deluxe Sling and Swathe safely positions the arm close to the body for immobilization. Cool, lightweight pile/foam construction provides patient comfort during rehab. 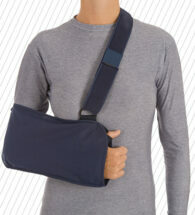 Two over-the-shoulder crisscross straps attach to the sling with contact closures. One size fits up to 54″ waist. Soft cotton/poly blend for increased comfort. Contact closure and D-rings for easy adjustment. Deluxe option has fully padded shoulder strap. Soft, perforated foam sling and detachable foam swathe. 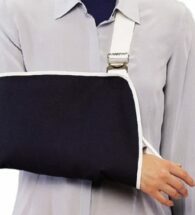 Sling fits over each shoulder (not around neck) with Velcro adjustment to position patient’s arm. 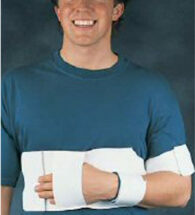 The 4” wide swathe is adjustable in circumference to keep arm securely against the body. 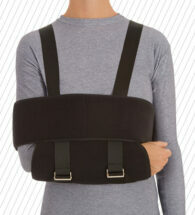 Traditional cradle arm sling in an adjustable universal design to fit most patients. Easy, fast and simple application with double D-rings and hook and loop closure. Comfort padding on shoulder strap. Navy poly/cotton material. Measure from elbow to base of little finger.